Essential for anyone involved with horses, whether you ride or are looking to buy a horse or want to learn more. Learn how to describe your horse in detail including ageing. This course will teach you all you need to know about horse identification. 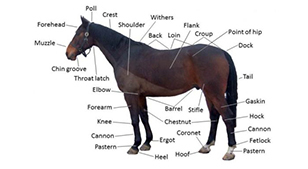 One of the most basic skills to learn is how to correctly describe and identify a horse. Whether you are talking to friends describing a horse that you have ridden, or whether you are describing to a vet where your horse is injured. Horses, as you well know, come in all sorts of shapes, sizes, and colours and this course will teach you all about horse identification.